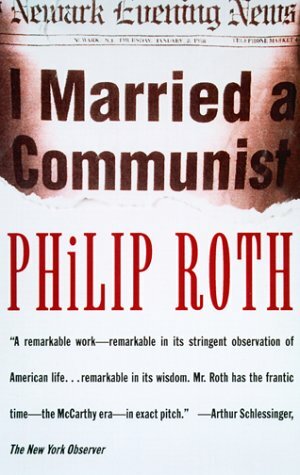 Philip Roth’s I Married A Communist is one a series of novels that use a narrator, Nathan Zuckerman, as a stand-in for the author. It’s a hodgepodge of a novel that serves to vent his feelings about the witchhunt days of the 1950s and to fire a shot at his ex-wife, Claire Bloom, whose tell-all book about their marriage preceded this effort. While it’s brilliant here and there, I Married A Communist serves more as a series of musings on failed marriage, Communism, politics vs. literature, isolation and relationships, than as a coherent novel. Since Roth is unable to create a compelling main character to carry us through this journey, we’re left with a novel that’s much less than the sum of its parts, something that might have worked better as a number of separate essays and a long short story. At the center of the action is a raging Newark tough named Ira Ringold, a man who proudly champions Communist ideals, but who is unable to reconcile his beliefs with the comfortable upper-middle class life he lives with Eve Frame, a famous actress. A stand-in for Bloom, she’s an emotional broken-glass of a person. Ringold, or "Iron Rinn," as he’s called when he becomes a well-known radio personality, is described through the words of Nathan, a young student of Ringold’s brother Murray. Murray, who also serves as narrator at times, is a high school English teacher in Newark, who also suffers as a result of his brother’s Communist beliefs (and his own outspokenness in general). So now, we’ve got three characters who serve as stand-ins for Roth: Nathan, Murray, and Ira, all representing some facet of his character. It’s too much. After spending time in the Army, where he’s first introduced to Communism, Rinn works in a number of places before meeting the thrice-married Frame, who’s in search of validation of her own existence. To her, the only constant is her daughter &#150; a monster of a person named Sylphid who knows her mother’s insecurities and uses them to her every advantage to get what she wants, and to drive a stake into Frame and Rinn’s marriage. Although Frame is more or less a puppet used by others with political power, she’s ultimately the one who betrays Rinn. Having set all this up, Roth also aims to condemn the tactics of those who helped destroy the lives of other people during the 1950s, the failure of the Communist movement itself to effect real change for the working class in society, and the misguided idealism of the movement’s followers. There’s some great, brilliant stuff in here. Communism-in-practice is represented by Rinn’s mentor, a character named O’Day, who lives a spartan existence in an effort to preserve that ideology. (O’Day also reflects Roth’s own insistence on shutting out the world when he writes). Rinn’s eventual destruction symbolizes the inability of this political movement to deliver on its promises and the ways in which its idealistic followers were betrayed. What’s frustrating is that Rinn, because he doesn’t have the intellectual capital to change his own situation, functions only as a symbol, rather than a breathing, living individual. Roth leaves us with a stupid, unflinching man who lacks the capacity to modify his thinking, vainly attempting to change others around him. It would have been nice to see Rinn formulate an intellectual response to his situation, but instead we’re left with a cipher who cannot account for his own actions. In a broad political context, that theme holds together &#150; the common man, screwed by every system, powerless. But that’s a pretty common theme in literature, and since Rinn’s emasculation also drives the personal conflict, it almost suggests that Roth, in his own marriage, was simply a witness to the destruction in his household, without any real responsibility for the breakdown of the relationships. Rinn’s destruction is intended to evoke sympathy, but sympathy is stifled by the frustrating choices the character makes. The reader feels rather more compassion for his brother, Murray, a smarter man whose choices doom his existence. The existence of the character of Murray illustrates the central problem in the novel’s construction. Claire Bloom, by her account, was married to a volatile, unpredictable man capable of wild mood swings and furious anger &#150; but also of great humor and great intellect. Roth divides himself into two characters, thereby attempting to refocus himself by separating his rage and his intellect. The headstrong, sharp Murray is otherwise perfect — someone all can look up to, including Roth. The stubborn Iron Rinn represents traits jettisoned by Roth from Murray’s character, and it allows Roth to absolve himself of his role in his familial relationships because Rinn doesn’t have the capacity to "handle" Frame and Sylphid. So while Rinn is reduced to representing the inability of people to communicate, the author unleashes all sorts of venom through the words of Murray, who, as a bystander to Rinn’s situation, serves as Roth’s voicebox. The message is telescoped and the reader never gets a chance to unearth the themes out of character and situation. Mixed in, there are some brilliant passages about politics and literature and the unending tug-of-war for Nathan’s mind between Rinn and Nathan’s professor, Leo Glucksman. One terrific bit of writing refers to politics as "the great generalizer" and literature as the "great particularizer," the two having little use for each other. This is virtuoso writing, but in the novel, it just spells out themes that Roth’s already exploring. Why not eliminate Murray’s character and give the words to Ira? Because that would establish reasoning on Ira’s part, and would entail Roth accepting responsibility for the breakdown of the marriage, of which the author accepts little. Dumbing the character down in this fashion is a cheat, especially because he’s presented as incisive and politically savvy earlier in the book. The book would have been more successful if it had paired the man’s rage and intellect &#150; a volatile, but more engrossing combination.